ANNA BELFER-COHEN • Department of Prehistory, Institute of Archaeology, Hebrew University, Jerusalem, Israel 91905. OFER BAR-YOSEF • Department of Antrhropology, Harvard University, Cambridge, Massachusetts 02138.
the critical transformation from mobile to sedentary ways of life and, by extension, changes in social organization in southern Levant. Interestingly, there is clear evidence to indicate that sedentism occurred independently of the development of an agricultural way of living in the Near East. For example, it has been argued that evidence for sedentism can already be observed in certain Middle Paleolithic Mousterian sites in Israel (Hietala and Stevens 1977; Lieberman 1993; Lieberman and Shea 1994). Moreover, the Early Natufian, in which evidence of sedentism was clearly observed (see below), was culturally a complex hunter-gatherer society that predated the agricultural communitiesby almost 3,000 radiocarbon years. The transition to sedentism was not a smooth process but a bumpy ride along a course that obviously was not planned, and its consequences were unforeseen. A number of crossroads can be identified along this route, where turns have been taken by the human group involved, according to the specific socioeconomic circumstances prevailing at some particular time. Sedentism can be very difficult to identify by strictly archaeological evidence, (i.e., the cultural material remains of the people involved, such as architecture, lithics, bone and groundstone implements, burials, etc.). As an alternative approach, during the last decade or so, researchers (e.g., Bar-Yosef 1983; Henry 1989) have shown preference for bioarchaeological evidence for sedentism such as high frequencies of human commensals-the house mouse, the house sparrow, and the rat (Auffray et al. 1988; Tchernov 1991); indications of year-round hunting cf gazelle, based on cementum increment analyses (Lieberman 1993); or the particular age profiles of hunted specimens—a steep rise in the young specimens (Davis 1983). In contrast, archaeological remains provide secondary evidence for the existence of sedentism. Stone and mud brick structures, heavy groundstone utensils, silos, and storage pits (mainly from the PPNA)-all these indicate a mode of existence combining year-round occupation of sites, interspersed with short, seasonal spells of anticipatory mobility, both of task groups and even of entire communities. Other indications of sedentism are certain demographic features deduced from the archaeological record, such as scalar stress indicated by the rise in the number of children, signs of primary social stratification, inter- and intragroup conflicts, and diseases (Agelarakis 1993; Bar-Yosef and Belfer-Cohen 1991; Belfer-Cohen 1991a, 1991b; Cohen 1985).Most of these phenomena have been observed in the archaeological record of the Natufian culture, although no indications of intrasite or intergroup violence were found, at least in the core-area sites where hundreds of human burials were uncovered (Belfer-Cohen,Schepartz and Arensburg 1991) . The Natufian, the most extensively dated Late Quaternary complex in the Levant (Byrd 1994a),isthe archaeological entity bridging two different ways of life: the first (hunting-gathering) prevailed more or less since the evolution of humans and is now replaced by the second (agriculture), which has basically sustained most of humanity to this day. The Natufian archaeological entity, therefore, is identified with the transformation from mostly mobile foraging to mostly sedentary agricultural cultivation, domestication of plants and animals, and herding. Initially identified and described by D. A. E. Garrod (1932), following her excavations at the Shukba Cave in the Judean hills, Natufian occurrences have subsequently been uncovered within the boundaries of what is now known as the Natufian "homeland"in the central Levant as well as other parts of the Near East (for a detailed description see Bar-Yosef 1983; Bar-Yosef and Belfer-Cohen 1989a; Belfer-Cohen 1989b, 1991b; Byrd 1989;Cauvin 1991, 1994; Henry 1989 and references therein) (Figure 1). The Natufian differs strikingly from preceding Epi-Paleolithic Levantine archaeological entities in its material culture, namely in the profusion of groundstone utensils, bone tools, art and decoration objects, and jewelry. It is also the first archaeological entity in the Levant featuring relatively substantial architectural remains as well as large burial grounds from which more than 400 individuals have so far been recovered (Byrd and Monahan 1995).Interestingly, the lithic industry remains basically similar to the preceding Epi-Palaeolithicones, in that the microlithiccomponent reaches 40% or more in all the assemblages. 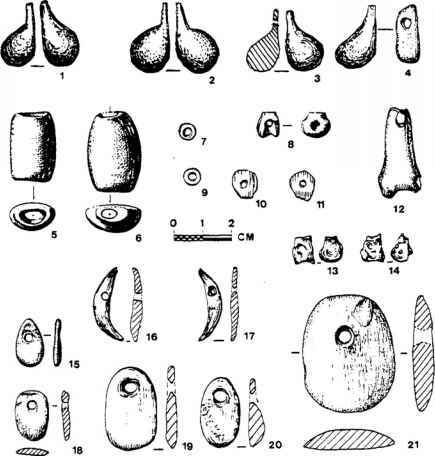 Of note are the picks (the forerunners of the future Neolithic ax-adzes group) and the sickle blades, which were most probably used for harvesting cereals (Unger-Hamilton 1991). Natufian sites are clearly dichotomized into base camps-large sites, demonstrating most of the features listed above, and smaller sites that contain little architecture, no burials, and poor bone and groundstone assemblages (Bar-Yosef 1983).The material recovered from sites of the latter type consists mainly of lithics, and the sites are commonly interpreted as ephemeral camps of various functions since they are usually located in marginal environments. In recent years, there has been a growing awareness among researchers that the Natufian culture as a whole should be subdivided according to different modes of adaptations and different environmental settings (Belfer-Cohen 1989b, 1991a, and see further discussion below). By extension, these subdivisions inform us as to the links between the emergence of sedentism and Natufian social structure. Figure 1 Map indicates location of Natufian sites in the Levant. The stippled area delineates the proposed Natufian homeland. aggregations gradually became permanent settlements, changing their way of life. By the onset of the Late Natufian (11,000-10,300bp), there were already, at least in the core area, sedentary hunter-gatherers specializing in particular food procurement strategies, namely intensive collection of cereals and/or acorns and lentils. The faunal remains, recovered from the various Natufian sites (see, for example Bar-Yosef et al. 1974; Bouchud 1987; Edwards 1987), reflect a 'broad spectrum' exploitation of food resources (Flannery 1973). Evidence cf severe depletion of the genetic pool of the local gazelle has been suggested to indicate intensive hunting of this species by the Natufians, which had purportedly led to 'inbreeding' (Cope 1991). Although rejected by Dayan and Simberloff (1995), this interpretation implies that the Natufians exerted some degree of cultural control on herds in their immediatevicinity, resulting in "protodomestication".We should bear in mind that there are other explanations for the size reduction in the gazelles, as for example the dry and cold conditions of the Younger Dryas. Most researchers agree that the Natufian, from its inception, can be defined as a complex society of specialized hunter-gatherers/collectors (Henry 1985). This particular social system influenced and modified much of the Natufian behavioral makeup: social structure, social behaviors and subsistence-acquiring practices. Note, however, that complex hunter-gatherer societies are not considered stable social units, and the Natufian was no exception (Henry 1991;Byrd 1994b).Henry (1991),for example, argues that complex societies of foragers ultimately provided their members with greater economic security. Yet, like most of the researchers cited herein, he agrees that even when such socioeconomic systems were fully established, they did not come near to attaining real stability but instead were "destined to fail over the not-so-long run" (Henry 1991:355). Sedentism and foraging are primarily opposed to each other with respect to the long term success of a population, since limited mobility triggers progressive population growth that cannot be sustained by fixed natural-resource ceilings. As noted by Keeley (1988), complexity creates resource stress—resource stress does not create complexity. Shnirelman (1992) supports this contention, maintaining that social evolution is more closely related to the degree of efficiency of a subsistence strategy than to the particular form of the economic activity. Thus, while the complexity of societies of specialized hunter-gatherers promoted sedentism and population growth, and intensified resource exploitation and the formation of social hierarchies, it also ultimately brought about the failure of "sedentary foraging." The fragility of complex groups is also discussed by Kosse (1994). She maintains that, while advantageous under certain conditions, socioeconomic complexity is not always essential for small-group survival. At the same time, however, groups had to grow in size in order to best adapt to a changing and heterogeneous environment and to compete effectively. Inevitably, beyond a certain population size threshold these groups became complex. Since large groups were most probably more advantageous in competition than small ones, and the "largesize of a local community was not only a consequence, but also a prerequisite for a highly efficient food-gathering economy"(Shnirelman 1992:188),it would seem that, contrary to what Henry (1991) proposes, complex hunter-gatherer societies were a relatively common phenomenon. Indeed, according to Schnirelman, there were many nonagricultural societies in the past, rather than only a few exceptions,which underwent social differentiationprocesses that progressed far beyond the early stages of complex hunter-gatherers (see Chapter 3, this volume). It is important to note that while competition favors larger groups, cost considerations favor smaller ones. Large groups, with their additional decision-making and coordinating institutions, are more expensive to maintain than simpler, smaller groups, and they become economically disadvantageous when marginal returns diminish. One option under such circumstances is to curtail growth and attempt to maintain some sort of equilibrium between population levels and resources. An economicallymore expensive option is to solve the problem of diminishing returns through the expansion of social networks. Fish and Fish (1991:403) suggest that "inview of its distributionalcontiguityand shared stylistic and technological attributes, the unifying structure of the Natufian could also be compared to an interaction sphere or an environmentally based commonality in economic orientation." They support their argument with the example of the Piman from southern Arizona and adjacent portions of Sonora who share a closely related family of dialects and maintain extensive social interactions, including frequent intermarriage, yet at the same time these different Piman groups still demonstrate a diversity of subsistence modes. This supports the possibility that the Natufian culture may have indeed developed a number of simultaneous, yet different, answers to the problems of daily existence. All these observations have to be taken into consideration while looking for the various ways and means Natufian groups employed to alleviate conditions of stress. Indeed, the instability characterizing the Natufian is also reflected in the differences between the Early and Late Natufian as well as between Natufian groups from different geographical regions. Different responses were dictated by the different circumstances and ultimately were linked to the social ordering of the Natufians, their mode of subsistence, and the development of sedentism. The territoriality observed among Natufian sites may also explain why the Natufians made use of sickles rather than beaters and baskets in harvesting cereals. It has been demonstrated (Hillman and Davies 1990) that the most convenient method of harvesting wild cereals is beating, yet it is efficient only in terms of the amount harvested per unit time, while in terms of amount harvested per unit area beating is no better than uprooting and sickling. If the limitations on the local groups were the small size of fields of wild stands, the methods used for harvesting would have necessarily been adapted so as to maximize energy returns per unit area instead of maximizing returns per unit time. The climatic episode of the "YoungerDryas"(10,80-10,300(? 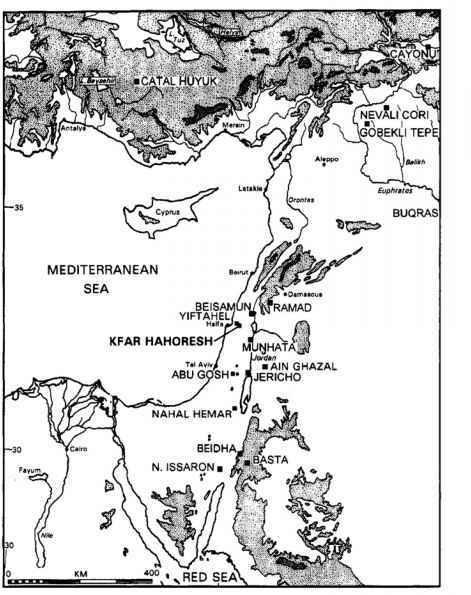 )bp), whose effects are well recorded from the Gahb and the Hula Valley in the northern and central Levant (Baruch and Bottema 1991), was probably a period of stress caused by the cold and dry conditions that also affected the Mediterranean coastal ranges of the Levant (Bar-Yosef and BelferCohen 1989a;Moore and Hillman 1992). It seems that during this period the yield of wild cereals, which are C3 plants, may have decreased (Bar-Yosef and Meadows 1995), a development that could have motivated the Late Natufians to cultivate wild cereals. Similar conclusions have been reached by Henry (1989, 1991) on the basis of site distributions, which he interpreted as reflecting major shifts in the resource base of wild cereals, and are supported by the study of the Natufian botanical material from Abu Hureyra (Hillman et al. 1989). Figure 2. Different types of jewelry made of bone from three Natufian sites: 1-4-El Wad (redrawn after Garrod and Bate 1937); 5-12-Ain Mallaha (after Perrot 1966); 13-21-Hayonim cave (after Bar-Yosef and Tchernov 1972;Belfer-Cohen 1991). ornaments and number and type of artistic objects and architecture, as well as an increase in the number of secondary and group burials (Belfer-Cohen 1989a; Belfer-Cohen et al. 1991; Garrod 1957). While most of the Early Natufian burials were primary, in the Late Natufian an increasing number of secondary burials are found along with primary burials of axial skeletons. At Hayonim Cave for instance, most of the Late Natufian group graves contain a single primary burial alongside several secondary ones. Indeed, each such primary burial may have been merely the "last one in,"which was to become a secondary burial when the grave was reopened. On the other hand, the increase in the frequency of secondary burials may reflect a change in the function of certain sites during the Late Natufian. At that time some sites may have been used more extensively as human bone repositories, as for example the site of Eynan (Mallaha), which at the end of the Natufian occupation might have functioned solely as a graveyard (Valla 1981, 1987; Perrot et al. 1988). Individuals may have been initially buried elsewhere and later transferred to a site, possibly in sacks (Perrot et al. 1988), in order to be reburied in their traditional home range (Valla 1991). This practice could then be regarded as solid evidence of greater mobility than that which is attributed to the Early Natufian (Belfer-Cohen et al. 1991). As observed by Garrod (1957), Natufian decorated burials are exclusively associated with the Early Natufian, and indeed, all of the decorated burials uncovered since are dated to the Early phase (Belfer-Cohen 1989a, 1995; Byrd and Monahan 1995). Perhaps the greater mobility of the later Natufian may be partly responsible for the disappearance of the decorated burials. Most of the Late Natufian burials were recovered from Eynan (Mallaha), Hayonim Cave, and el-Wad,where the numbers of burials dwindle and most of them are secondary. The same also holds for the burials at the Late/Final Natufian site of Nahal Oren (Grognier and Dupouy-Madre 1974). The decorative items recovered from graves in the Early Natufian did not constitute burial offerings but were personal jewelry or, more probably, garment ornaments. Therefore it is quite possible that the increasing tendency toward secondary burials contributed to the disappearance of this custom which was quite rarely practiced to begin with. It should be emphasized that production of beads and other decorative items did not stop during the Late Natufian, yet they were made for the use of the living rather than for the dead (Belfer-Cohen 1991a, b). The 'cemetery evidence' from some sites suggests not only increased mobility but also more overt expressions of territorial boundaries in the Late Natufian. Specifically, the larger number of multi-individual graves from this phase can be interpreted as an expression of group cohesion, since they indicate more concentrated efforts toward reburial in specified locations serving as territorial markers or means of limiting social inequality (Perrot et al. 1988;Kuijt 1996). Consideration of Natufian skeletal data raises the possibility that the stature of the Late Natufians may reflect circumstances of stress (BelferCohen et al. 1991). Inter-group differences in mean male/female stature can indicate environmental stress conditions. Under such conditions, taller individuals achieve less of their potential stature than shorter individuals, which in turn tends to reduce sexual dimorphism within the population under study by the decrease in male stature. Thus, reduction in the difference in male/female stature between the Early and the Late Natufian (11.5-12.9cm in the former and 8.0-8.6cm in the latter, Belfer-Cohen et al. 1991), is indica tive of possible stress conditions during the later stages of the Natufian. It should be noted, however, that this varies between the Natufian populations, and no portion of these populations shows any evidence of serious stress (such as signs of malnutrition, violence, dramatic reduction in height, etc.). There is a clear-cut dichotomy in the Early Natufian between the sedentary-permanent, semipermanent, seasonal sites in the Natufian Levantine homeland and the non-Natufian hunter-gatherers living in surrounding regions of the Saharo-Arabian vegetation belt. In contrast, by the Late Natufian it is difficult to differentiate between permanent and seasonal sites. 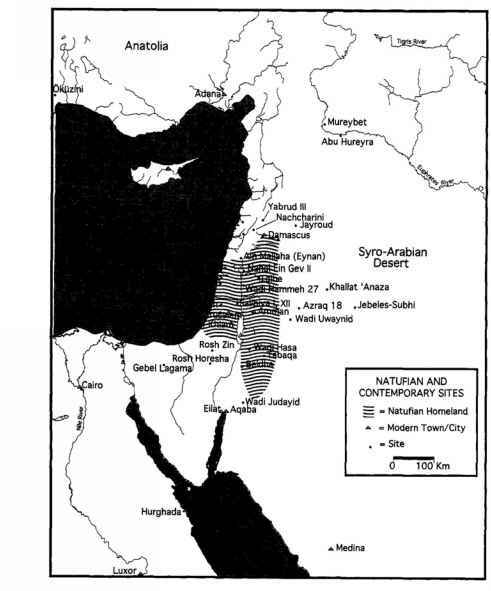 A major shift can be observed at the end of the Late Natufian in the size and location of settlements and in their distribution, as illustrated by the Late Natufian sites in the Negev (Goring-Morris 1987) and southernJordan (Henry 1995). These settlements are ephemeral and contain only scanty architectural remains. It seems as if the Natufians were forced into a more mobile settlement pattern than that observed in the core area, adopting a mobile way of life similar to that of earlier hunter-gatherers in this region, as if groups inhabiting the region reverted to a life of greater mobility while trying to adapt to particular local/territorial conditions. This is well illustrated by the case of the Harifian, located mainly in the Negev, which represents a short lived attempt at an arid adaptation that lasted for only about 500 years (Goring-Morris 1987,1991;Bar-Yosef 1987). The potential for subsistence shifts away from sedentary and intensified tendencies would likely be greatest among groups whose social and demographic patterns had been least shaped by long traditions of such experience. During initial portions of the transition to domestication economies in both regions, commitments to emerging food producer stances are likely to have been more ephemeral, and multidirectional shifts more commonplace.